It doesn’t take much to break the bonds that hold a snowpack together, releasing a cascade of snow and debris down a mountainside scarred by avalanche paths. But it’s our avalanche technicians’ job to beat Mother Nature to the punch near BC highways. 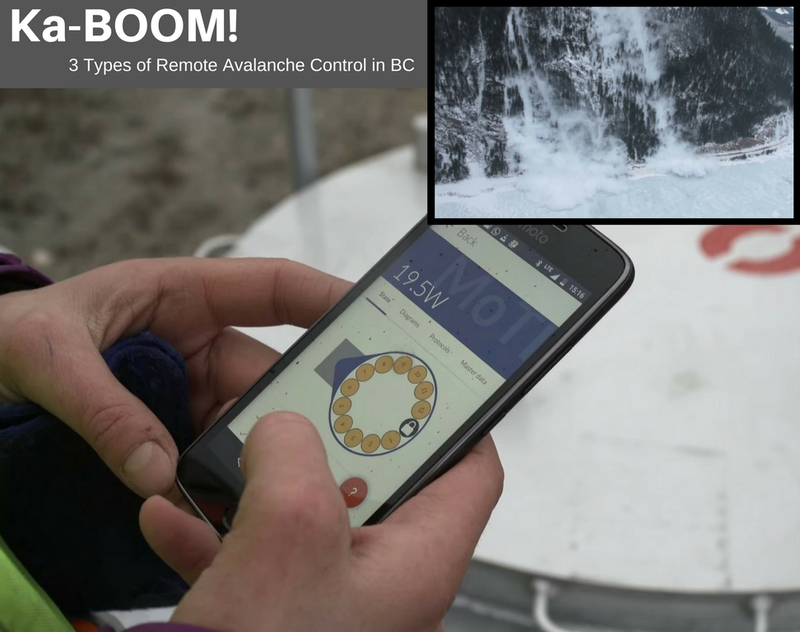 While the most common method for triggering controlled avalanches is helibombing (in other words, dropping explosives from a helicopter), our Avalanche Safety Program has three types of Remote Avalanche Control Systems (RACS) in four critical avalanche areas in BC. Each system involves its own unique method, but all three allow our techs to remotely trigger avalanches with a wireless device. Why does this matter? It allows us to perform avalanche control at any time of the day or night, regardless of harsh weather that would otherwise keep helicopters grounded. So, compare a 1.5-hour highway closure versus having to close the highway due to the avalanche hazard and waiting until daylight – 12 hours later – to begin helibombing. Location: The ministry has three Avalanche Guard towers located on Highway 1 near the border of Glacier National Park, east of Revelstoke. How it works: The Avalanche Guard tower is installed close to the avalanche start zone and holds explosive charges inside a metal box. Each tower has multiple tubes at the ready behind the box’s door, which opens when there is a call to arms. The tower acts like a mortar, propelling an explosive charge from one of the tubes into the avalanche start zone. Location: The ministry has 24 Gazex exploders along Highway 3 at Kootenay Pass, and three along Highway 99 (Duffy Lake Road) north of Pemberton. How it works: The Gazex exploder is installed in an avalanche start zone, and uses an explosive mixture of propane and oxygen inside a metal tube to trigger the avalanche. Location: The ministry has nine Wyssen towers on Highway 1 in the Three Valley Gap avalanche area, 20 km west of Revelstoke. How it works: The Wyssen Avalanche tower has a deployment box holding 12 explosive charges, which can be individually deployed. The charge is dropped by a retaining line, and hangs from the cord at a pre-set height above the snow cover. After a time delay, the charge explodes. To reload, a helicopter lifts the deployment box and transports it to the crew on the ground. These Remote Avalanche Control Systems are just part of our Avalanche Safety Program. Learn firsthand what it’s like to monitor and unleash these wintry beasts in this interview with one of our avalanche techs.